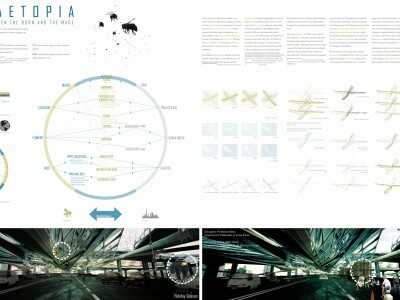 WINNING PROJECT – Innovative Minds 2012 – APIDAETOPIA | gURROO - A new generation of innovative minds. 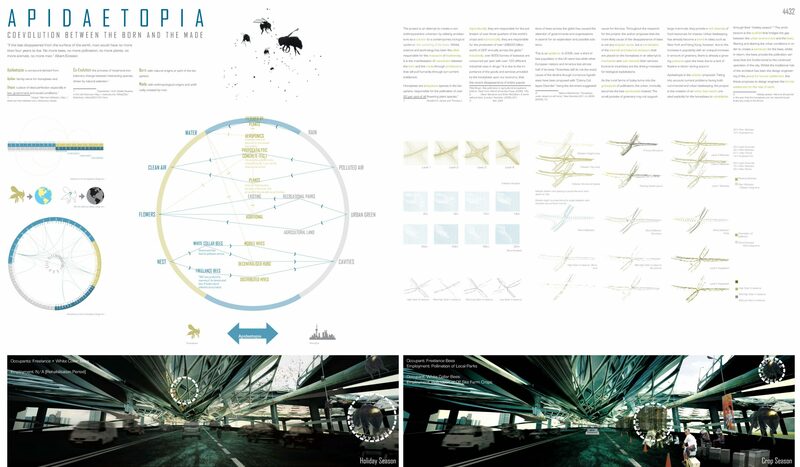 The project is an attempt to create a non-anthropocentric urbanism by utilising architecture as a solution to a contemporary biological epidemic: the vanishing of the bees. Whilst science and technology has been the villain responsible for the massacre of biodiversity, it is the manifestation of coevolution between the born and the made through architecture that will pull humanity through our current bottleneck. Honeybees are a keystone species in the biosphere, responsible for the pollination of over 80 per cent of all flowering plant species. Agriculturally, they are responsible for the pollination of over three quarters of the world’s crops and economically, they are responsible for the production of over US$220 billion worth of GDP annually across the globe. Industrially, over 8000 tonnes of beeswax are consumed per year with over 120 different industrial uses in drugs. It is due to the importance of the goods and services provided by the honeybees upon our economy, that the recent disappearance of entire populations of bees across the globe has caused the attention of governments and organisations in search for an explanation and possible solutions. This is an epidemic. In 2008, over a third of bee population in the UK were lost while other European nations and America lost almost half of its bees.Scientists still do not the exact cause of the decline though numerous hypotheses have been proposed with “Colony Collapse Disorder” being the dominant suggested cause for the loss. Throughout the research for the project, the author proposes that the more likely cause of the disappearance of bees is not any singular cause, but a combination of the internal and external stressors that are placed on the honeybees in an attempt to mechanise and over intensify their services. Economic incentives are the driving motivation for biological exploitations. As the rural farms of today turns into the graveyards of pollinators, the urban, ironically, becomes the bee sanctuaries instead. The small pockets of greenery may not support large mammals, they provide a rich diversity of food resources for insects. Urban beekeeping has already become a trend in cities such as New York and Hong Kong; however, due to the increase in popularity with an unequal increase in amount of greenery, there is already a growing pressure upon the hives due to a lack of flowers in bloom during autumn. 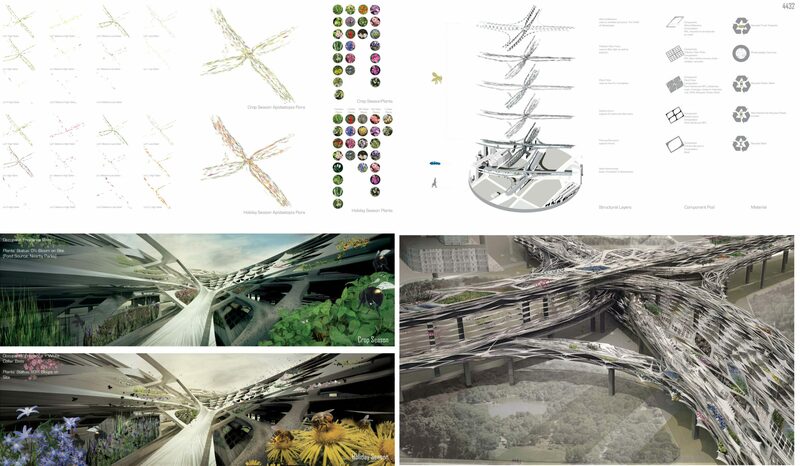 Apidaetopia is the solution proposed. Taking into account current problems facing both commercial and urban beekeeping, the project is the creation of an urban bee resort, created explicitly for the honeybees to rehabilitate through their “holiday season”.The architecture is the scaffold that bridges the gap between the urban environment and the bees, filtering and altering the urban conditions in order to create a sanctuary for the bees, whilst in return, the bees provide the pollination services that are fundamental to the continued operation of the city. 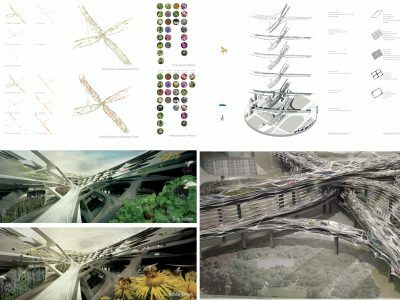 Whilst the traditional role of the architect has been the design engineering of the planet for human settlement, this thesis proposes to design engineer the human settlement for the rest of earth. Rosalind R. James and Theresa L. Pitts-Singer, Bee pollination in agricultural ecosystems (Oxford; New York: Oxford University Press, 2008). 145. Alison Benjamin and Brian McCallum, A world without bees (London: Guardian, 2008). 251. Debora MacKenzie, “Honeybees under attack on all fronts,” New Scientist 201, no. 2695 (2009): 10. Holiday season refers to the period in the year that the honeybees are not required to pollinate any crops in the farms.